The Beyond Reality Costumers' Guild is an organization of costume enthusiasts of all levels of ability, dedicated to promoting the art and love of costuming through teaching, learning, and exhibiting our costumes. We are comprised of fantasy and science fiction costumers, historical costumers, SCA costumers, reenactors, dancers, theatrical costumers, professional costumers and hobbyists, fiber and bead artists, photographers, and other fans of the art of costume. We are a chapter of the International Costumers' Guild and serve the Pacific Northwest, including Canada. We produce events, such as our The Night of the Living Debs Halloween party, and we get together about once a month for meetings or events, such as our yearly Sari Safari and a Festival of the Broken Needles, as well as workshops to learn new techniques. We are blessed here in the Northwest with a number of great costumers and specialized costuming societies. We currently hold meetings once month on a Tuesday night, see our events page for the date and location of the next meeting. To have a good time doing what we love to do-costume. To promote the art and love of costuming, and to encourage others to act on their creativity. To always learn, to teach others, and to help each of with new, weird costuming techniques. To assist each other in finding great costuming supplies, to go in on the big sales together, and to commiserate on the lack of closet space. To promote and help run fantastic masquerades, and to get out the information on them early enough to make the big gaudy costumes. 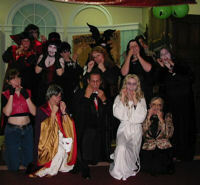 To share event, venue, and show information where we can wow'em with our costumes. To keep in contact with other costuming guilds and societies. To use our talents and energy to help in charitable causes. To have some killer parties. But mostly, to have fun. Even the vampires know the importance of good dental hygiene. BRCG members take a picture for a local dentist. For more pictures of BRCG members and events see the photo gallery.